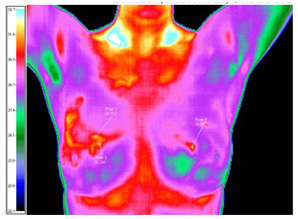 The Center for Women’s Health at the Center for Occupational and Environmental Medicine is pleased to be the first medical facility in the Charleston area to offer Breast Thermography, utilizing infrared digital thermal imaging. The Center’s Breast Health Program has been operating for nearly five years, and has performed over 1,000 breast thermography studies for women from all over the Southeastern United States. Women seem to especially like that The Center’s program not only provides visualization of breast tissue but can also include recommendations for individualized nutritional supplementation and lifestyle changes, depending upon the results of the thermogram. With application of these viable prevention measures, women can see for themselves when cancer risk factors have decreased by observing the positive changes in breast tissue. We are pleased that many women have found the experience so helpful that they have chosen annual follow-ups as part of their own preventive medicine programs. 1) Why did The Center decide to offer a Breast Thermography Program? Eighty percent of all cancers are environmentally triggered, so environmental causes such as diet, lifestyle, and exposures to toxic substances all need to be addressed in order to reduce cancer risk. Also, the Center’s Breast Thermography Program offers women the best opportunity to identify changes in breast tissue up to 6 years before a clinically recognizable tumor or malignancy presents itself and before it can be seen by mammography. The Center’s Breast Thermography Program offers women a secondary diagnostic tool to identify potentially dangerous changes in breast tissue which could indicate the presence of a tumor or malignancy.. The thermogram is able to identify early pre-cancer/cancer cells because it can detect changes that occur in the tissues surrounding the cancer cells. Just as scaffolding goes up at the construction site of a new building, an infrastructure of new blood vessels forms to nurture and sustain a developing cancer. It is these blood vessel changes, with their increased blood flow and heat, which Thermography’s ultra-sensitive infrared camera can detect. 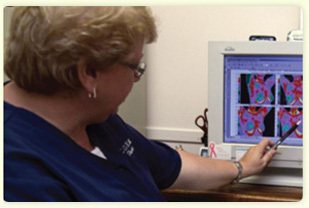 2) What are the advantages of The Center’s Breast Thermography Program? 3) Why should women get breast thermograms? Breast cancer rates are increasing every year. Today 1 in 8 women will develop breast cancer in their lifetime, and a new case is diagnosed every 2 ½ minutes. Breast cancer is the leading cause of cancer death in women ages 20 to 59. This year 39,800 women are expected to die of breast cancer in the United States. Recovery rates for breast cancer patients have not improved significantly in more than 40 years. It is clear that one of the most important keys to avoiding or surviving breast cancer is to diagnose the problem as early as possible. If pre-cancer/cancer cells are identified in the earliest stage, it is possible to not only significantly improve survival but to even reverse the process before a cancerous mass is formed! At The Center, we help patients learn how to apply specific preventive measures. Since The Center’s Breast Thermography Program is a safe and effective adjunct tool for identifying early pre-cancer/cancer cells in breast tissue, it can be a very important part of a woman’s preventive medicine program. Please note that Thermography should be used in conjunction with Mammography and not as a substitute for Mammography. For more information, please contact our office at (843) 572-1600, or see our in-depth website devoted just to The Center’s Breast Thermography Program at www.earlycancerdetection.com. Epstein, Samuel. Dangers and Unreliability of Mammography. International J. Health Services, Vol.31(3):605-615. Wright CJ, Mueller CB. Screening Mammography and Public Health Policy. The Lancet July 1 2005 vol.346:29-32.